On a scale of one inch to a statute mile this is the master sheet of the O/S maps of London. 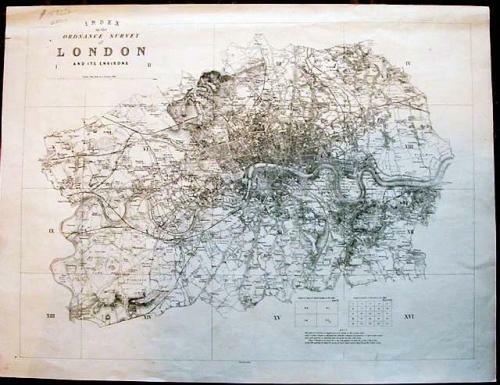 The engraving encompasses an area from (moving clockwise from the east): Brentford, Hanwell, Wilsdon, North Hampstead, Hornsey Walthamstow, Wanstead, Ilford, East Ham, Woolwich, Eltham, Sydenham, Lower Norwood, Tooting, Kingston and Richmond. The buildings in the Central London area have been engraved in a 3-D effect and topographical details have been carefully hatched-in.